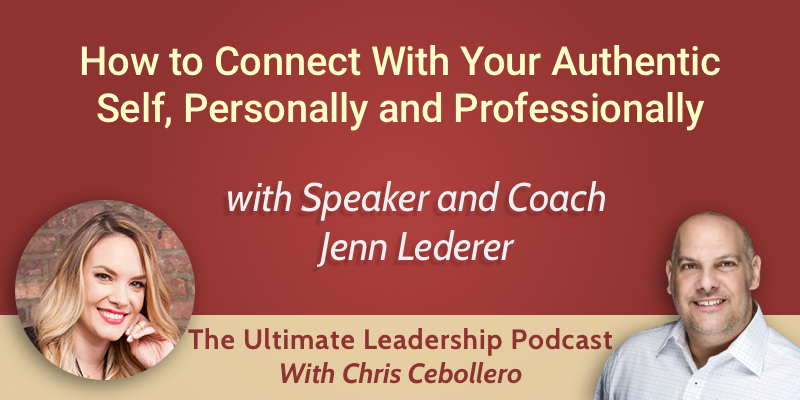 On today’s podcast, we are joined by motivational speaker and leadership coach Jenn Lederer about how to be your authentic self in your personal and professional life. She runs the Weekly Alignment podcast, which is described as ‘your source of accidental inspiration’. Jenn says that people often only live from their neck up and don’t connect with anything below that. They become obsessed with how people observe them but don’t observe themselves. If you learn to connect with yourself, you are able to run a business which doesn’t overwhelm you. When you are your authentic self, you no longer have to struggle. Jenn shares her top five tips for connecting with your authentic self, with actionable steps you can take in your life right now. When you bump into someone, do you say ‘sorry’ or ‘excuse me’? By saying sorry, you are subconsciously apologizing for being in that space to another person. Allowing yourself to take up space in your personal life is key if you want to go into the world and make a difference. If you don’t believe you’re worthy, you won’t go out into the world and take up more space. There is a ripple effect on how you lead yourself and others in your personal life by using ‘excuse me’ rather than ‘sorry’. Teams do best when everyone feels like they’re allowed and have permission to be seen and heard. If you start by saying ‘excuse me’ rather than ‘sorry’ in your professional life, it stops other people from being expected to apologize, even if an idea isn’t a great one. If you think about male and female professionals in the workforce, it seems like there may not be an equality there for women to be able to say ‘my opinion matters’, and this is something which Jenn is very passionate about. To overcome the gender bias in professional leadership, women need to not agree with any preconceived notion that they are less than or not worthy. If you don’t agree with it, you won’t act like it. People around you can have as many beliefs as they want, but if you’re in a room and you know you’re worthy and add value, you will speak that way. You can’t control preconceived notions, but you can control how you react to it. By using ‘but’ rather than ‘and’ when sharing an idea, you cut yourself off at the starting line and are met with ideas of why it can’t or won’t happen. This tip is based on the improvisation rule of ‘yes and’, where if someone gives you a reality you have to build on it with ‘and’ rather than ‘but’. Using ‘but’ makes the energy and possibilities of an idea drop, so if you get into a habit of saying ‘and’ you can discern what is workable from this idea and how you build on it, rather than shutting yourself down. By using this tip in your personal life, you will begin to notice how often your critical voice takes the lead. The path to an authentic self-begins with permission. Give yourself permission to take some space to explore who you are and how you want to show up in the world by using ‘and’. ‘And’ has a benefit in your professional life as teams work better when there’s a sense of freedom to explore. By using ‘and’, there is no right or wrong answer and all ideas are built upon. This creates a mindset of everyone working together, rather than being placed against each other in competition. If you are a type A person, you reside in the all or nothing zone of life. If you’re on, you’re all the way on, and if you’re off the world won’t hear from you. If you get into the habit of checking in and asking what you want and desire in this moment, you can look for how you can create it in your life. Pleasure is a birthright, yet society teaches us it’s no pain no gain, and that you have to spend 40-50 years proving yourself in order to enjoy the last part of your life. This mindset isn’t productive. Tap into what you want and be willing to go after it unapologetically. In your personal life, shutting down desires subconsciously tells your body what you want doesn’t matter and that they aren’t as valid as your to-do list or money. This makes you diminish your own value. You need to be seen for who you are, and if you see yourself as not valued you won’t be able to put yourself out there. Cultivating a professional environment of self-care is crucial for growth, so have conversations with your team on how they are taking care of themselves and working towards their goals outside of work. Not prioritizing self-care will generate resentment towards the rest of your team, yet it is your job to do this for yourself. Asking yourself what you want helps to deliver better results and prevents burnout. Throughout your day and in all situations, ask yourself “how does it get better than this?”. If things are challenging, this question strengthens the muscles to start looking for something more. The universe hears the message and answers the question by sending ideas, inspiration, thoughts, people, and opportunities. If you’re having a good day, you can still ask the question. We are infinite beings who can’t reach full maxed out pleasure. Asking this question in your personal life creates the practice of remembering you’re always supported. If you’re scared of something, ask the question as there is always a source behind you ready to answer. When you feel supported, it leads to you being able to take bigger risks, and getting used to asking is when we give ourselves permission to do so. When a professional team is stuck and think they have uncovered everything they can, asking the question makes creative problem-solving. It will get your team used to look where you think you don’t need to look. Our favorite excuse for not taking care of ourselves is that we are needed by other people. We think we have to spread ourselves thin because we’re needed, and if we set boundaries the world will collapse. People aren’t counting on you to save them, but to remind them to save themselves. When you set a boundary, you’re not there all the time as no person can be, and it gives someone else the opportunity to step up. A type A person finds value in being needed, and it’s how they convince themselves they are worthy. This practice in your personal life reminds you that with or without being needed, you are always valued. If you engage in self-care, you are refueled so that you can fully show up when you step back into your job. Setting boundaries shows other people around you that they can do it too. If you have clear boundaries with your team, you create a sense of safety and understanding. When everyone has set their boundaries within a working environment, it encourages respect and the ability to find a middle ground to focus on a productive space and what is important.